So the talk of the week has been this 1-5 record for the Wizards. What does it all mean for the team? The Cavs have gone 0-6 and fired the coach that led them to a title and we have a team here that is throwing up quite a few points, but seems to be getting kicked around defensively. Is this the problem? Is missing Dwight Howard the missing link? At this point only the game tonight in Memphis will prove what is really wrong with this team. Watching some of the past few games against Golden State, Sacramento and the Clippers, you could see some of the talent this team has as a whole, but you can’t just rely on John and Brad each and every night to make it happen with 20 to 25 points from your bench, when the opponents are throwing up 1oo to 140 points a game. There has been some great moments from Jeff Green and Austin Rivers off the bench, but missing Ian and the absence of Keef in scoring in two of the games has certainly made for some issues, but something Wizards Head Coach Scott Brooks doesn’t seem too worried about. “This is a long road trip to start the season and listen this is just 6 games. We play 82 remember,”said Brooks. While we don’t disagree that a road trip of this caliber is a great way to start the season, but you have to test this team at some point. Why not throw the Blazers and Warriors in the mix and let the team mature and feel out what is wrong. I don’t think the missing part of the equation is Howard alone, but making sure that all of these players are contributors where they need to be. There is no need to be getting blown out by 15 to 20 points with a team of this caliber. if we get to 10 games and Brooks is still looking for answers, well then the chemistry mix is just not right. Fix it before its too late and it becomes a toxic mess asit has in previous seasons when their stars have been with the team for 7 to 8 years. The next biggest test for the Wizards comes on November 2nd as they face OKC at home, who also find themselves off to a rough start at 1-4 this season. 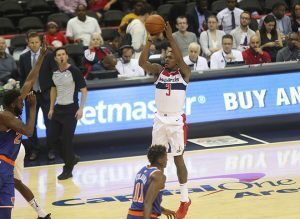 Their opponents are averaging 111.8 points a game, something that the Wizards are very capable of doing with this talent. Time to get the train rolling and pull out of the station before all of the others leave and this is just a train left in a siding for dead.